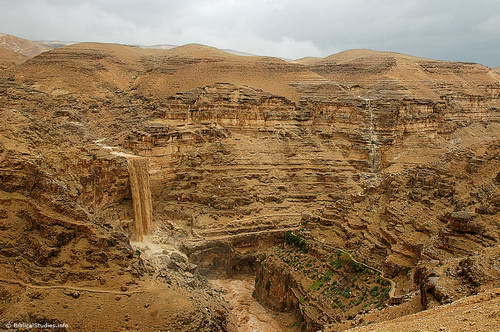 Todd Bolen, over at BiblePlaces Blog, calls attention to an article in the Jerusalem Post about an American tourist who was killed in a Flash Flood at En Gedi. He calls attention, in one of the links, to some photos I made April 2, 2006 of a flash flood in the Wilderness of Judea. Afterwards I wrote an article about it for Biblical Insights. Read Todd’s blog and then read my article below. Todd also includes a beautiful photo of Nahal David at a more tranquil time. Rivers in the Desert is the title of Nelson Glueck’s 1959 history of the Negev. These rivers also may be seen in the Judean wilderness and in the Sinai. Thomas Levy followed up on some of Glueck’s research in a Biblical Archaeology Review article in 1990. If one travels in the desert during the summer months he will see a dry, desolate bad land with only an isolated tamarisk tree or shrub where the last water of the winter rain flowed. In the winter it can be different. Israel has two dominant seasons: winter and summer. The summer is dry and the winter is wet. The early rains begin about mid-October and continue till the late rains of early April. See Deuteronomy 11:14 and Joel 2:23.
he wilderness of Judea receives very little rain, but the area is affected by the rains that fall in the central mountain range (Jerusalem and the Mount of Olives; Bethlehem; Hebron). We sometimes describe the road that runs along that range as the water parting route. The rain that falls must seek its lowest level. From an elevation of about 2500 feet above sea level the water flows east through the wadis to an elevation of more than 1300 feet below sea level at the Dead Sea. Levy reminds us that “Nahal, incidentally, is Hebrew for a dry river bed or valley that flows at most a few times a year. In Arabic, the word is wadi. The two words are used interchangeably in Israel today.” The wadi is similar to the arroyo of the American southwest. Several members of my group told me of being awakened during the morning of April 2 by the severe storms in Jerusalem. At breakfast I explained to the group that this would be no problem for our planned sightseeing; we would just go to the Dead Sea and Masada. Eli, our guide, told the group that when we came out of the new tunnel that now cuts through the mountain between Mount Scopus and the Mount of Olives, it would probably be dry. In fact it was still raining on us almost all the way to the Jordan Valley. Our driver decided to pull off the highway onto the old road that overlooks the Wadi Kelt (Qilt) on the way down to Jericho. On the south side of the wadi there is an overlook allowing a view of the Monastery of Saint George of Koziba. There we saw one of the most fascinating sights that can be imagined. It rained an astounding 4.41 inches in Jerusalem. This is about three times what the city normally gets for the entire month of April. 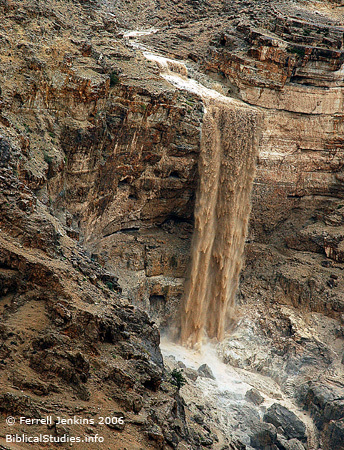 In this normal desert land there was a tremendous waterfall pouring down the side of the cliff into the wadi. Our guide said, and another experienced guide is reported to have told his group, that he had never seen it like this. That evening Todd Bolen and his wife were my guests for dinner at the hotel. Todd has lived and taught in Israel for the past ten years. He has provided us with excellent photos in his Pictorial Archive of Bible Lands (see bibleplaces.com). He was excited about the photos I had taken that day and included three of them on his blog. He was headed for Galilee the next day. He reported seeing hail at En Gev on the Sea of Galilee. 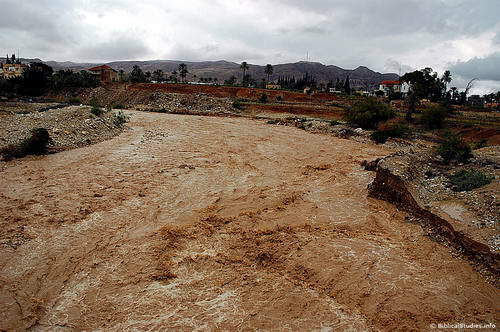 The Jerusalem Post ran a photo of the flooded road at the Megiddo junction, and reported that five people had died as a result of the heavy rains. Not only could we not get to Masada that day, but we could not go to Qumran on the shores of the Dead Sea. A couple of days later when we visited these sites we saw the damage to the road in multiple places where the wadis descended to the Dead Sea. Debris could be seen in the Dead Sea. In forty years of travel in the Bible Lands, this was one of my most exciting days for photography. I am delighted to share it with you. 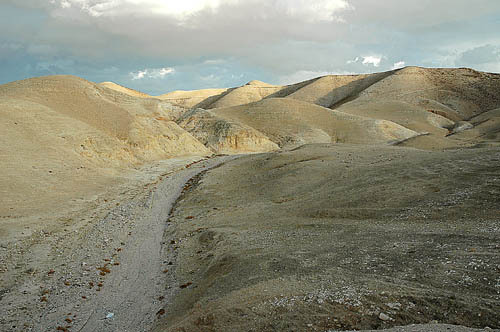 The photo below is of a typical dry wadi in the Wilderness of Judea.